When people interact in the economy, they do so because there is some opportunity for them to gain; but there is often some conflict about how these gains should be shared. We use game theory to show why the pursuit of self-interest can sometimes lead to results that are considered good by all participants (an example of this is called the invisible hand), or outcomes that none of the participants would prefer (an example is called the tragedy of the commons). Social dilemmas like antibiotic misuse or environmental degradation occur when an actor does not fully take account of the effects of her decisions on others. We collect data from experiments and use other evidence to show that self-interest, a concern for others, and a preference for fairness are all important motives that explain how people interact. We illustrate how the tools developed in this unit can be applied to a range of economic situations, including the global challenge of climate change. Bacteria become resistant to antibiotics—turning into ‘super-bugs’—when we use them too often, in the wrong dosage, or for conditions that are not caused by bacteria. Doctors recognize that leaving the allocation of antibiotics to the market has damaging consequences. In India, for example, antibiotics are easily available over the counter in pharmacies without a doctor’s prescription and misuse is common. In these situations, people often use antibiotics when other treatments would be better. Even when antibiotics are appropriate, patients often stop taking the antibiotics to save money, when they feel a little better. These are exactly the patterns of use that will produce antibiotic-resistant pathogens. For the patient, however, the treatment worked—or seemed to work—and the unlicensed doctor’s business will prosper. The overuse of antibiotics occurs because the user does not take account of the costs that will be imposed on others when antibiotic superbugs proliferate. The problem of misuse of antibiotics is far from unique. It is an example of what is called a social dilemma. Social dilemmas—like antibiotic misuse or environmental degradation—occur when people do not take adequate account of the effects of their decisions on others, whether these are positive or negative. In Unit 1, you learned that, because the effects on others are not fully taken into account, they are called external effects or externalities. The example used was how our decisions about what to consume, how to generate power and other environmentally sensitive choices affect our neighbours, those in other countries, and future generations. Here, the external effect is that my misuse of an antibiotic may result in the superbug that kills you: overusing antibiotics for minor illnesses may allow the sick person to recover more quickly, but it also creates the external effect of antibiotic-resistant super bacteria that will kill many others. Similarly, traffic jams happen when our choice of a way to get around—for example driving alone to work rather than car-pooling—does not take account of the contribution to congestion and the longer commute times inflicted on others. Social dilemmas occur frequently and diminish the quality of our lives and the lives of others. One of the tasks of public policies is to address social dilemmas. In 1968, Garrett Hardin, a biologist, published an article about social dilemmas in the journal Science, called ‘The Tragedy of the Commons’.1 Hardin described a group of cattle herders, each raising ever-larger herds and eventually overgrazing their pastureland, driving it, their animals, and the herders themselves to ruin. Hardin’s tragedy of the commons is a social dilemma. He wrote that resources that are not owned by anyone (sometimes called ‘common property’ or ‘common-pool resources’), such as the earth’s atmosphere or fish stocks, are easily overexploited unless we control access in some way. Fishermen would be better off if each were to catch fewer tuna in any given year, preserving stocks for the future catch. Humanity would be better off if businesses and individuals around the world would make choices limiting the emission of pollutants, or the use of antibiotics. But if you cut your own consumption, reduce your carbon footprint, or limit the number of tuna you catch, you will bear the costs, while others will enjoy the benefits today and in the future. Examples of Hardin’s tragedies and other social dilemmas are all around us: if you live with roommates, or in a family, you know just how difficult it is to keep a clean kitchen or bathroom. When one person cleans, everyone benefits, but it is hard work. Whoever cleans up bears this cost. The others are sometimes called free riders. If, as a student, you have ever done a group assignment, you understand that the cost of effort (to study the problem, gather evidence, or write up the results) is individual, yet the benefits (a better grade for the group project, higher class standing, or simply the admiration of classmates) go to all the members of group.2 A project member who does not care about the other members of the group may free ride; if all do this, the project will not amount to much and the grades of all project members will suffer. Hardin’s tragedy of the commons raised a warning flag against a common economic idea that you encountered in Unit 1, namely the invisible hand. The invisible hand implies that individuals pursuing their own interest, without regard for the interests of others, create an outcome that is good for everyone. The possibility that the pursuit of individual self-interest can be consistent with the common good dates back to Adam Smith, the eighteenth-century founder of economics. He wrote that, under the right laws and economic institutions (private property and competition, among many economic actors), this invisible hand would guide the economy towards an outcome that would benefit all. We will see that there are conditions under which Smith’s remarkable claim can be true, and we will explain how this works. But Hardin’s example of environmental degradation and many other similar social dilemmas show that it is often not true. That’s why Hardin called his ‘tragedy’ a ‘rebuttal to the invisible hand’. When we think about some economic or social or even biological problem, and how it might be resolved, we need to have in mind these two big ideas—the invisible hand and the tragedy of the commons. When we see a social interaction, we must ask whether it is a situation in which individuals, pursuing their own interests, will create an outcome that is good for all, or whether the pursuit of private gain will result in outcomes that no one desires. The answer will differ on a case-by-case basis, and so will the remedies. Some social dilemmas are resolved by communities, and some by government action. Some are avoided or at least moderated because humans have motives other than self-interest. There is nothing new about social dilemmas. We have been facing them since prehistory. More than 2,500 years ago, the Greek storyteller, Aesop, wrote about a social dilemma in his fable, Belling the Cat.3 A group of mice needs one of its members to place a bell around a cat’s neck. Once the bell is on, the cat cannot catch and eat the other mice. But the outcome may not be so good for the mouse that takes the job. Each mouse would like to free ride on some other brave (or perhaps suicidal) mouse. There are countless examples during wars or natural catastrophes in which individuals sacrifice their lives for others who are not family members, and may even be total strangers. These actions may be motivated by altruistic preferences, meaning a willingness, or even desire, to help others, even at a cost to oneself. People differ in their preferences—the way they compare and evaluate alternatives. For example, some people prefer coffee to tea, others prefer tea, and others do not like either. Self-interested preferences: A person with these preferences makes a decision according to how it affects her personally, ignoring the effects on others. Altruistic preferences: A person with these preferences cares about the implications for other people. Given the chance he would prefer to help some other person, even if it cost something to do so. Our preferences may describe the food we like to eat, the importance we place on family as opposed to work, or how much we value free time as opposed to the money we would make if we worked more. We will see that preferences, along with other information, are part of our explanation of why people do what they do. Altruistic preferences are not the only way that societies resolve social dilemmas and reduce free riding. Sometimes the problems can be resolved by government policies. For example, governments have successfully imposed quotas to prevent the over-exploitation of stocks of cod in the North Atlantic. In the UK, the amount of waste that is dumped in landfills, rather than being recycled, has been dramatically reduced by a landfill tax that requires people to pay for what otherwise would be the external costs they impose on others. Local communities also create institutions to regulate behaviour. Irrigation communities need people to work to maintain the canals that benefit the whole community. Individuals also need to use scarce water sparingly so that other crops will flourish, although this will lead to smaller crops for themselves. In Valencia, Spain, communities of farmers have used a set of customary rules for centuries to regulate communal tasks and to avoid using too much water. Since the Middle Ages, they have had an arbitration court called the Tribunal de las Aguas (Water Court) that resolves conflicts between farmers about the application of the rules. The ruling of the Tribunal is not legally enforceable. Its power comes only from the respect of the community, yet its decisions are almost universally followed. Even present-day global environmental problems have sometimes been tackled effectively. The Montreal Protocol has been remarkably successful. It was created to phase out and eventually ban the chlorofluorocarbons (CFCs) that threatened to destroy the ozone layer that protects us against harmful ultraviolet radiation. The carbon emissions that result in global climate change have proven a more difficult challenge. We return at the end of the unit to global efforts to reach agreement about mitigating climate change. Identify two social dilemmas that have been reported (try to use examples not discussed above). For each, explain why it is a social dilemma. Which of the following is an example of a social dilemma? This is a social dilemma because, if you do the washing up, then others would be free riding on your effort. Social dilemmas occur when people do not take adequate account of the effects of their decisions on others. The fact that an issue is discussed on social media does not make it a social dilemma. Caring for the elderly is an issue that society (the government or individuals) must address, but it is not a social dilemma because it does not arise from people not taking adequate account of the effects of their decisions on others. This is a social dilemma because drivers fail to take into account the effects of their driving on other drivers. Which of the following is an example of free riding? Although these people can get a free ride on the subway, they are not free riders in an economic sense, because they do not benefit from another person’s effort. The small shareholders are free riding on the efforts of large investors, who have spent time studying the accounts and the reports. This example of free riding was mentioned in Section 2.1. This is a problem, but not due to free riding, because one fisherman does not benefit from another fisherman’s effort. It is instead a coordination failure known as the tragedy of the commons. In this unit, we will identify cases in which Adam Smith’s reasoning about the invisible hand as a way of representing how people interact in the economy is a reasonable guide to public policy. We also study other cases that are more like Hardin’s tragedy of the commons. 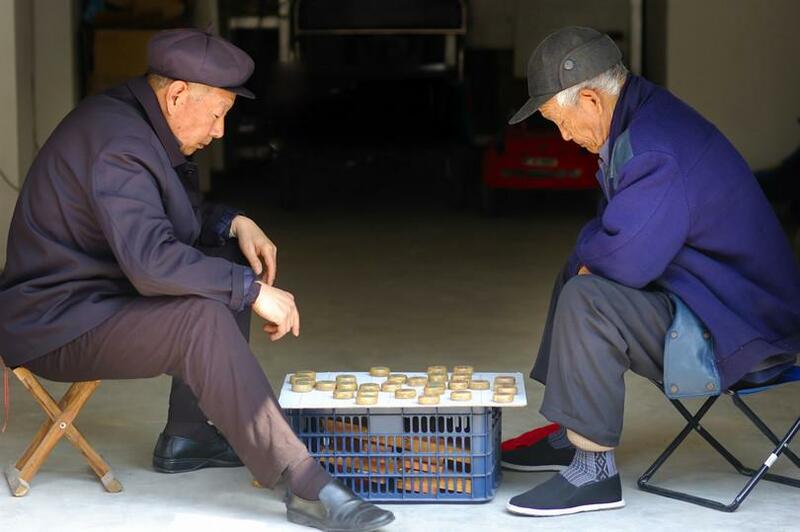 To distinguish between the two cases, we will use the tools of game theory to model social interactions, in which the decisions of individuals affect other people as well as themselves. We will look at situations that result in social dilemmas and how people can sometimes solve them—but sometimes not (or not yet), as in the case of climate change. On which side of the road should you drive? If you live in Japan, the UK, or Indonesia, you drive on the left. If you live in South Korea, France, or the US, you drive on the right. If you grew up in Sweden, you drove on the left until 5 p.m. on 3 September 1967, and at 5.01 p.m. you started driving on the right. The government sets a rule, and we follow it. But suppose we just left the choice to drivers to pursue their self-interest and to select one side of the road or the other. If everyone else was already driving on the right, self-interest (avoiding a collision) would be sufficient to motivate a driver to drive on the right as well. Concern for other drivers, or a desire to obey the law, would not be necessary. An experiment designed to study some aspect of human behaviour. evidence about how people behave, which comes from behavioural experiments. These behavioural experiments let us see that people are both selfish and generous, sometimes indifferent to the wellbeing of others, and sometimes guided by ethical, religious or other moral rules of behaviour. Psychologists also use experiments to investigate behaviour under controlled conditions. Not all social interactions lead to social dilemmas, even if individuals act in pursuit of their own interests. We will start with an example where the ‘invisible hand’ of the market, as described by Adam Smith, channels self-interest so that individuals acting independently do reach a mutually beneficial outcome. To see how game theory can clarify social interactions, imagine two farmers, who we will call Anil and Bala. They face a problem: should they grow rice or cassava, or both? They benefit from choosing one crop: They could thus produce some of one crop and some of the other, but they benefit from specializing in one or the other crop because the knowledge and tools required for each differs. Their land differs: Anil’s land is better suited for growing cassava, while Bala’s is better suited for rice. For these two reasons, they can do better by participating in a social interaction and specializing than by going it alone. Each farmer must decide which crop to produce. They decide this independently, which means they do not meet to discuss a course of action. When people are engaged in a social interaction and are aware of the ways that their actions affect others, and vice versa, we call this a strategic interaction. A strategy is defined as an action (or a course of action) that a person may take when that person is aware of the mutual dependence of the results for herself and for others. The outcomes depend not only on that person’s actions, but also on the actions of others. Models of strategic interactions are described as games. Game theory is a set of models of strategic interactions. It is widely used in economics and elsewhere in the social sciences, and even in biology and the training of military strategists. Assuming independent decisions may seem odd in this model of just two farmers, but later we apply the same logic to climate change, in which hundreds or even millions of people interact, most of them total strangers to one another. Therefore, it is useful for us to assume that Anil and Bala do not come to some common agreement before taking action. They both sell whatever crop they produce in a nearby village market. On market day, if they bring less rice to the market, the price will be higher. The same goes for cassava. A game in which a single Nash equilibrium is Pareto efficient. See also: Nash equilibrium, Pareto efficient. Figure 2.1 describes their interaction, which is what we call a game. We will refer to this particular interaction between Anil and Bala as the invisible hand game. Let’s explain what Figure 2.1 means, because you will be seeing this a lot. You will become familiar with the terms used in game theory as we work through a variety of games in this unit. Anil’s choices are the rows of the table and Bala’s are the columns. We call Anil the ‘row player’ and Bala the ‘column player’. When an interaction is represented in a table like Figure 2.1, each entry describes the outcome of a hypothetical situation. For example, the upper left cell should be interpreted as: ‘Suppose (for whatever reason) Anil planted rice and Bala planted rice too. What would we see?’ Since both are producing rice, there is a glut of rice on the village market, which will result in a low price. And there is a shortage of cassava. Because we have assumed that Anil is better at producing cassava than rice, when they both plant rice he is doing worse than Bala. There are four possible hypothetical situations. Figure 2.1 describes what would happen in each case. Social interactions in the invisible hand game. Figure 2.1 Social interactions in the invisible hand game. A game that is played once and not repeated. A table of the payoffs associated with every possible combination of strategies chosen by two or more players in a game. There are no other people involved or affected in any way. The selection of which crop to grow is the only decision that Anil and Bala make. Anil and Bala will interact just once (because of this, it is called a one-shot game). They decide simultaneously. When a player makes a decision, that player doesn’t know what the other person has decided to do (just like in the rock–paper–scissors game). Figure 2.2a shows the payoffs for Anil and Bala in each of the four hypothetical situations in a standard format that we call a payoff matrix. Payoffs: These are the incomes they would receive if the hypothetical row and column actions were taken. A matrix: This is just any rectangular (in this case square) array of numbers. Since their incomes depend on the market prices, which in turn depend on their decisions, we have called this an invisible hand game. There is a fifth hypothetical situation (not shown), in which both produce some of both crops for their own use (they don’t go to the market), and as a result of not specializing at all, each get just 1. The payoffs in the invisible hand game. Figure 2.2a The payoffs in the invisible hand game. They do better, or at least as well, by interacting with each other (that is, playing the game, and getting the payoffs shown in the table) rather than going it alone (and getting just 1). Because the market price falls when it is flooded with one crop, they can do better if they specialize compared to when they both produce the same good. When they produce different goods, they would both do better if each person specialized in the crop that was most suitable for their land. Which of the following statements are true, based on the payoff matrix in Figure 2.2a? If Anil chooses Rice and Bala chooses Cassava, they both get a payoff of 4. The best outcome for both Anil and Bala is if both specialize in the crop that is most suitable for their land. Anil and Bala only benefit (each individual is strictly better off) from the interaction if they choose to produce different crops. If Anil and Bala choose the same crop, both of them would still be better off than producing crops for their own use (rather than selling crops at the market). They both get a payoff of 4 if Anil chooses Cassava and Bala chooses Rice. If Anil chooses Rice and Bala chooses Cassava, they both get a payoff of 2. The best outcome is if Anil chooses Cassava and Bala chooses Rice. If they don’t produce different crops, one of them will only get a payoff of 1, which is the same benefit they would get from subsistence farming. In order for both players to benefit from the interaction, they must produce different crops. If they choose the same crop, one person would be better off, while the other person would earn the same payoff (1) as producing crops for his/her own use. Game theory describes social interactions, and it may also provide predictions about what will happen. To predict the outcome of a game, we need another concept: best response. This is the strategy that will give a player the highest payoff, given the strategies the other players select. In Figure 2.2b we represent the payoffs for Anil and Bala in the invisible hand game in a payoff matrix. We have simplified the way we write a payoff matrix a little, and will use this format more often. The first number in each box is the reward received by the row player (whose name begins with A as a reminder that his payoff is first). The second number is the column player’s payoff. Think about best responses in this game. Suppose you are Anil, and you consider the hypothetical case in which Bala has chosen to grow rice. Which response yields you the higher payoff? You would grow cassava (in this case, you—Anil—would get a payoff of 4, but you would get a payoff of only 1 if you grew rice instead). Work through the steps in Figure 2.2b to see that choosing Cassava is also Anil’s best response if Bala chooses Cassava. Cassava is therefore Anil’s dominant strategy: it will give him the highest payoff, whatever Bala does. You will also see that Bala has a dominant strategy too. The analysis gives you a handy method for keeping track of best responses by placing dots and circles in the payoff matrix. The payoff matrix in the invisible hand game. Figure 2.2b The payoff matrix in the invisible hand game. If Bala chooses Rice, Anil’s best response is to choose Cassava—that gives him 4, rather than 1. Place a dot in the bottom left-hand cell. A dot in a cell means that this is the row player’s best response. Figure 2.2b-b If Bala chooses Rice, Anil’s best response is to choose Cassava—that gives him 4, rather than 1. Place a dot in the bottom left-hand cell. A dot in a cell means that this is the row player’s best response. If Bala chooses Cassava, Anil’s best response is to choose Cassava too—giving him 3, rather than 2. Place a dot in the bottom right-hand cell. Figure 2.2b-c If Bala chooses Cassava, Anil’s best response is to choose Cassava too—giving him 3, rather than 2. Place a dot in the bottom right-hand cell. Both dots are on the bottom row. Whatever Bala’s choice, Anil’s best response is to choose Cassava. Cassava is a dominant strategy for Anil. Figure 2.2b-d Both dots are on the bottom row. Whatever Bala’s choice, Anil’s best response is to choose Cassava. Cassava is a dominant strategy for Anil. If Anil chooses Rice, Bala’s best response is to choose Rice (3 rather than 2). Circles represent the column player’s best responses. Place a circle in the upper left-hand cell. Figure 2.2b-e If Anil chooses Rice, Bala’s best response is to choose Rice (3 rather than 2). Circles represent the column player’s best responses. Place a circle in the upper left-hand cell. If Anil chooses Cassava, Bala’s best response is again to choose Rice (he gets 4 rather than 3). Place a circle in the lower left-hand cell. Rice is Bala’s dominant strategy (both circles are in the same column). 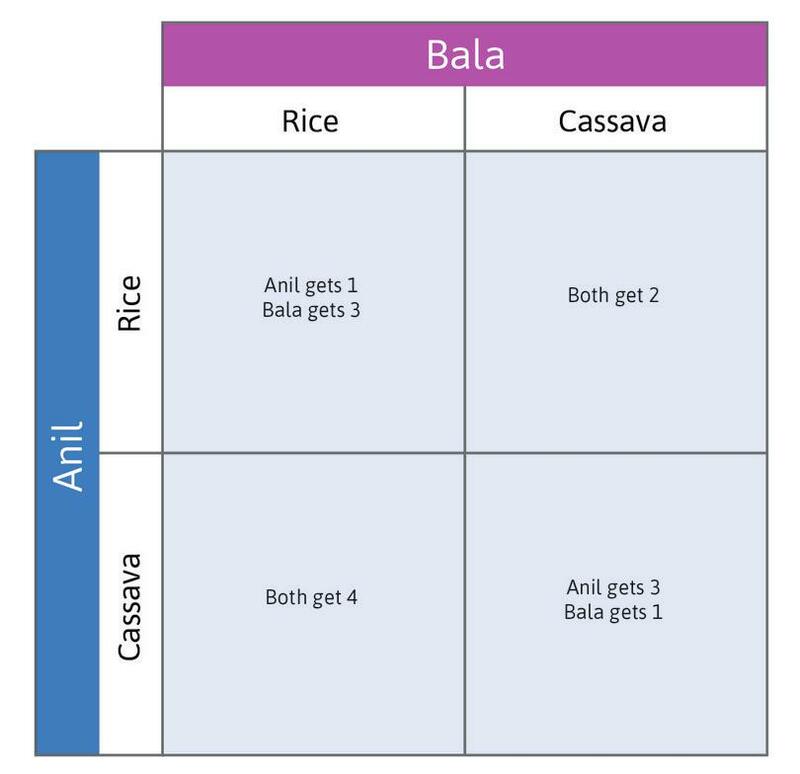 Figure 2.2b-f If Anil chooses Cassava, Bala’s best response is again to choose Rice (he gets 4 rather than 3). Place a circle in the lower left-hand cell. Rice is Bala’s dominant strategy (both circles are in the same column). We predict that Anil will choose Cassava and Bala will choose Rice because that is their dominant strategy. Where the dot and circle coincide, the players are both playing best responses to each other. Figure 2.2b-g We predict that Anil will choose Cassava and Bala will choose Rice because that is their dominant strategy. Where the dot and circle coincide, the players are both playing best responses to each other. Because both players have a dominant strategy, we have a simple prediction about what each will do: play their dominant strategy. Anil will grow cassava, and Bala will grow rice. This pair of strategies is a dominant strategy equilibrium of the game. An equilibrium is a self-perpetuating situation. Something of interest does not change. In this case, Anil choosing Cassava and Bala choosing Rice is an equilibrium because neither of them would want to change their decision after seeing what the other player chose. If we find that both players in a two-player game have dominant strategies, the game has a dominant strategy equilibrium. As we will see later, this does not always happen. But when it does, we predict that these are the strategies that will be played. Because both Anil and Bala have a dominant strategy, their choice of crop is not affected by what they expect the other person to do. Even though the decision does not depend on what the others do, the payoff does. For example, if Anil is playing his dominant strategy (Cassava) he is better off if Bala plays Rice than if Bala plays Cassava as well. the strategy that yielded the largest total payoffs for the two farmers combined. A social interaction is a strategic interaction where people are aware of the ways that their actions affect each other. A dominant strategy is the strategy that gives the player the highest payoff, irrespective of the strategies selected by other players. A strategy is an action that a person may take when that person is unaware of the effect of their action on others. A best response is the strategy that results in the socially optimal outcome if all players choose it. This is the other way around; a strategic interaction is a social interaction where people are aware of the ways that their actions affect each other. This is the definition of a dominant strategy. A strategy is an action that a person may take when that person is aware of the mutual dependence of the results for herself and for others. A best response is the strategy that will give a player the highest payoff, given the strategies the other players select. In this example, the dominant strategy equilibrium is the outcome that each would have chosen if they had a way of coordinating their decisions. Although they independently pursued their self-interest, they were guided ‘as if by an invisible hand’ to an outcome that was in both of their best interests, and in this society of two people, produces the best social outcome. Real economic problems are never this simple, but the basic logic is the same. The pursuit of self-interest without regard for others is sometimes considered to be morally bad, but the study of economics has identified cases in which it can lead to outcomes that are socially desirable. There are other cases, however, in which the pursuit of self-interest leads to results that are not in the self-interest of any of the players. The prisoners’ dilemma game, which we study next, describes one of these situations. Latin for ‘economic man’ referring to an actor assumed to adopt behaviours based on an amoral calculation of self-interest. When economists disagree Homo economicus in question: Are people entirely selfish? For centuries, economists and just about everyone else have debated whether people are entirely self-interested or are sometimes happy to help others, even when it costs them something to do so. Homo economicus (economic man) is the nickname given to the selfish and calculating character that you find in economics textbooks. Have economists been right to imagine homo economicus as the only actor on the economic stage? Yet everyone has experienced, and sometimes even performed, great acts of kindness or bravery on behalf of others in situations in which there was little chance of a reward. The question for economists is: should the unselfishness evident in these acts be part of how we reason about behaviour? Some say ‘no’; many seemingly generous acts are better understood as attempts to gain a favourable reputation among others that will benefit the actor in the future. Maybe helping others and observing social norms is just self-interest with a long-time horizon. This is what the essayist H. L. Mencken thought: ‘… conscience is the inner voice which warns that somebody may be looking.’5 Since the 1990s, in an attempt to resolve the debate on empirical grounds, economists have performed hundreds of experiments all over the world in which the behaviour of individuals (students, farmers, whale hunters, warehouse workers, and CEOs) can be observed as they make real choices about sharing, using economic games. In these experiments, we almost always see some self-interested behaviour. But we also find that people are willing to help others even at a cost to themselves, to reciprocate kindness even if their payoffs would be greater otherwise, and other kinds of behaviour inconsistent with self-interest. In many experiments, homo economicus is the minority. This is true even when the amounts being shared (or kept for oneself) amount to many days’ wages. Is the debate resolved? Many economists think so and now consider people who are sometimes altruistic, sometimes inequality averse, and sometimes reciprocal, in addition to homo economicus. They point out that the assumption of self-interest is appropriate for many economic settings, like shopping or the way that firms use technology to maximize profits. But it’s not as appropriate in other settings, such as how we pay taxes, or why we work hard for our employer. Use an inexpensive chemical called Terminator: It kills every insect for miles around, both pests and beneficial insects. Terminator also leaches into the water supply that they both use. Use integrated pest control (IPC) instead of a chemical: A farmer using IPC introduces beneficial insects to the farm. The beneficial insects eat the pest insects. If one farmer chooses Terminator and the other one chooses IPC: There is some damage to insects and the water supply, but it is limited. (This describes the upper right and lower left cells). If they both choose Terminator: Water contamination becomes a serious problem, and they need to buy a costly filtering system (the lower right cell). If they both choose IPC: Pest insects are eliminated and the water supply is safe (the upper left cell). Social interactions in the pest control game. Figure 2.3a Social interactions in the pest control game. Both Anil and Bala are aware of these outcomes. Anil knows that his individual payoff depends not just on the choice of pesticide he makes, but also on the choice that Bala makes (and likewise for Bala). Like the invisible hand game, this type of situation is a strategic interaction. The payoff for Anil and Bala is their profit—the amount of money they will make at harvest time, minus the costs of their pest control strategy and the costs of installing water filtration, if that becomes necessary. Figure 2.3b shows the respective payoffs for Anil and Bala. Payoff matrix for the pest control game. Figure 2.3b Payoff matrix for the pest control game. What will each of them choose to do? We can use the payoffs to predict the outcome. We can use the same method as in the invisible hand game (draw the dots and circles in the payoff matrix for yourself). If Bala chooses IPC: Anil’s best option is to choose Terminator (payoff is 4, he gets cheap eradication of pests, and because he alone is using Terminator, there is little water contamination). If Bala chooses Terminator: Anil again does best to choose Terminator (he gets a greater payoff than if he chooses IPC because Terminator is cheaper and, in any event, Bala’s Terminator chemicals would kill off the IPC’s beneficial pests). Terminator therefore is Anil’s dominant strategy. 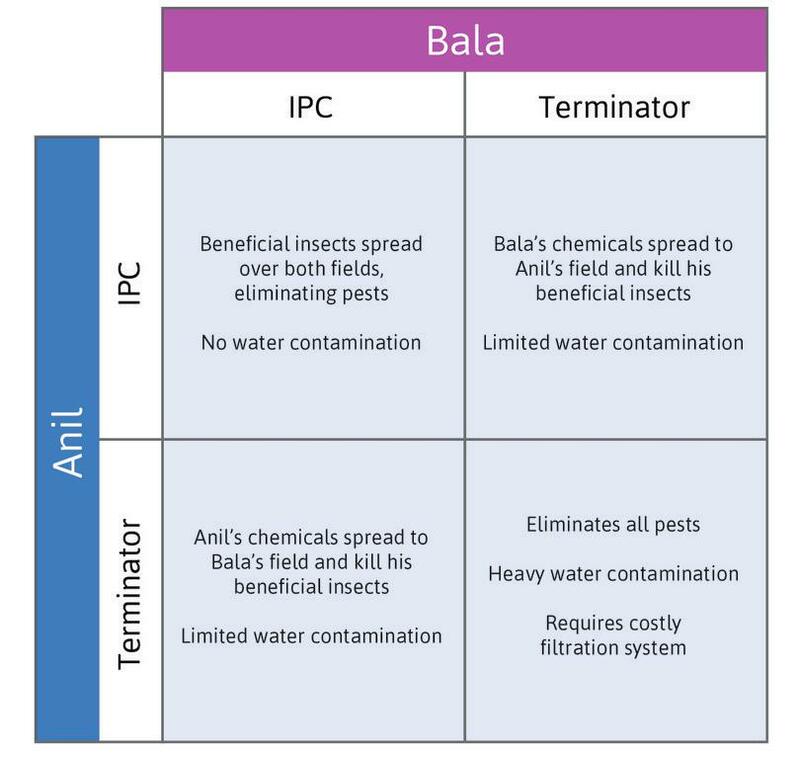 If Anil chooses IPC: Bala’s best option is to choose Terminator (payoff is 4, he gets cheap eradication of pests, and because he alone is using Terminator, there is little water contamination). You can check, similarly, that Terminator is also Bala’s best response if Anil chooses Terminator. Bala’s dominant strategy is therefore Terminator. Because Terminator is the dominant strategy for both, we predict that both will use it. Where every player plays his or her dominant strategy in a game, this is called a dominant strategy equilibrium of the game. Many people consider political advertising (campaign advertisements) to be a classic example of a prisoners’ dilemma situation. Using examples from a recent political campaign with which you are familiar, explain whether this is the case. 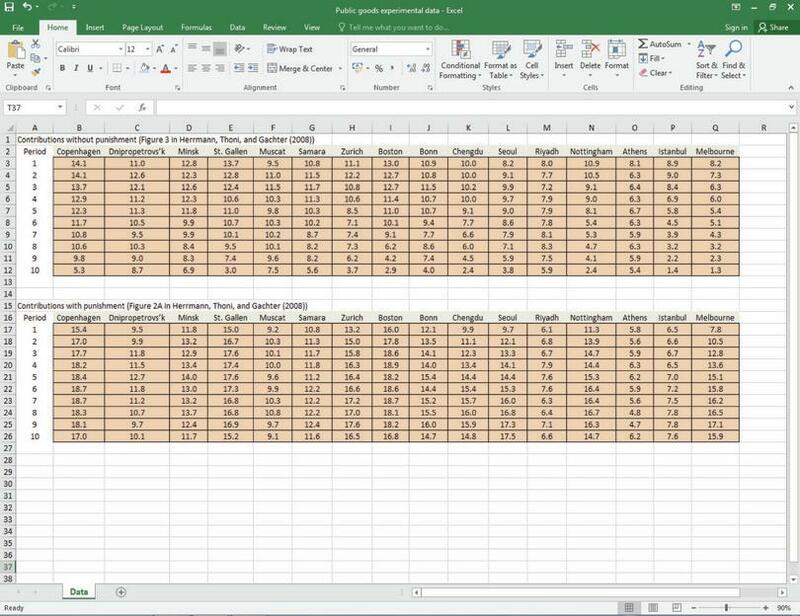 Write down an example payoff matrix for this case. Anna and Brian are discussing what to watch on TV tonight. There are two choices—a film or the snooker world championships. They can either watch one of the two programmes together, or watch different programmes in separate rooms. The following table represents the happiness levels (payoffs) of Anna and Brian, depending on their choice of programme (the upper number is Brian’s happiness level, while the lower number is Anna’s). Based on this information, which of the following statements are correct? Figure 2.4 Snooker or film? Anna’s dominant strategy is to watch the film. Brian’s dominant strategy is to watch snooker. There is no dominant strategy equilibrium. The dominant strategy equilibrium is for both to watch snooker. Anna is better off choosing the same programme as Brian than choosing a different one. Therefore, neither strategy is dominant. Brian gets higher payoffs by choosing snooker rather than a film, regardless of Anna’s choice. There is no dominant strategy equilibrium, as one player (Anna) has no dominant strategy. Alan and Beatrice have broken the rules and colluded in their coursework assignment, so the examiners are going to interview them. The interviews are taking place simultaneously and there is no communication allowed between the two. The students can either deny or confess to have colluded. The raw marks without penalty are 65 for Alan and 70 for Beatrice. The examiners have decided on the following scheme: if they both deny, they will be penalised by 20 marks respectively; if one denies and the other confesses, then the denying student gets zero marks, while the confessing student retains their raw mark; if they both confess, then they both get the pass mark of 40. The possible outcomes are summarised in Figure 2.5. Figure 2.5 Deny or confess? Based on this information which of the following statements is correct? The dominant strategy equilibrium will result in the highest aggregate mark. It is in the students’ interests to deviate from the dominant strategy equilibrium. Denying is the dominant strategy. The examiners have managed to devise a scheme in which the students will definitely confess. The dominant strategy equilibrium is (Confess, Confess). This results in a lower aggregate mark than (Deny, Deny). The dominant strategy equilibrium means that there is no incentive to deviate from the equilibrium, as the other strategy would give lower payoffs, holding the other player’s choice fixed. Confessing is the dominant strategy, because players get a higher payoff from confessing than from denying (given what the other player does). This is true as (Confess, Confess) is the dominant strategy equilibrium. 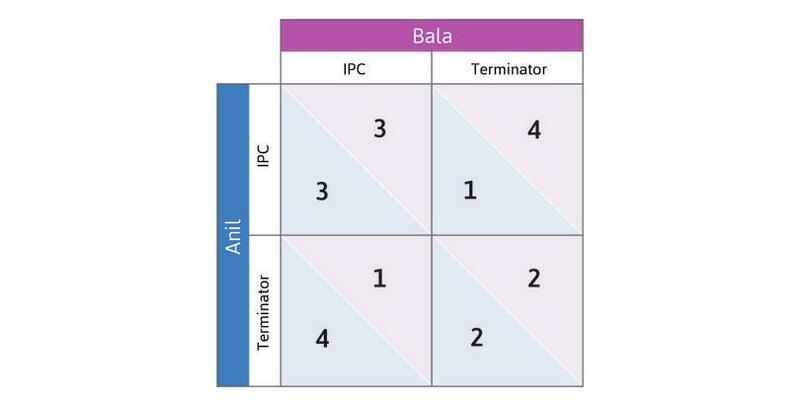 In our game, Anil and Bala each receive payoffs of 2, but both would be better off if they both used IPC instead. The predicted outcome is therefore not the best feasible outcome. The pest control game is a particular example of a game called the prisoners’ dilemma. Another example is Hardin’s tragedy of the commons, where the failure of cattle herders to take account of the impact of grazing on the common pool resource of the meadow led to the collapse of the ecosystem. They did not place any value on the payoffs of the other person—Anil doesn’t worry about the elimination of Bala’s beneficial insects. If he did, he might take a different decision (see ‘Caring about others: altruism’ below). There was no way that Anil, Bala, or anyone else could make the farmer who used the insecticide pay for the harm that it caused. They were not able to make an agreement beforehand about what each would do. Had they been able to do so, they could have simply agreed to use IPC, or banned the use of Terminator. If we can overcome one or more of these problems, the outcome preferred by both of them would sometimes result. 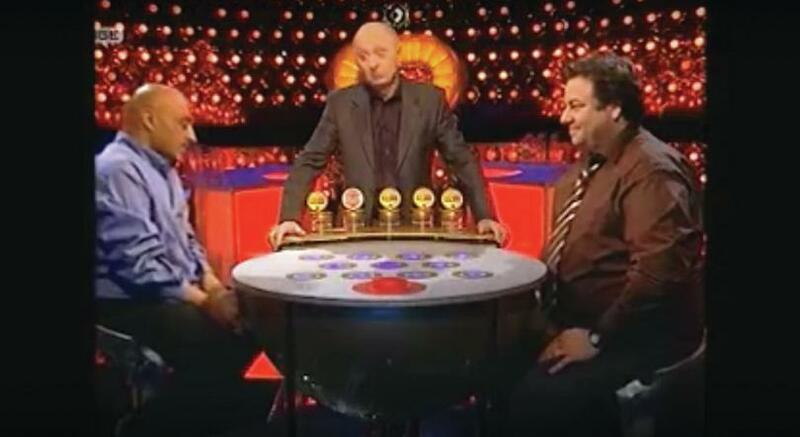 Watch the clip from a TV quiz show called Golden Balls, and you will see how one ordinary person ingeniously resolves the dilemma. In our model, the interaction between Anil and Bala was a one-shot game. But ongoing relationships are an important feature of social interactions; as owners of neighbouring fields, Anil and Bala are more realistically portrayed as interacting repeatedly. A game in which the same interaction (same payoffs, players, feasible actions) may occur more than once. Imagine how differently things would work out if we represented their interaction as a game to be repeated each season. This version of the game is called a repeated prisoners’ dilemma. Let’s say that, in Season 1, Bala adopts IPC. What is Anil’s best response if he knows there will be future seasons? He would reason like this: ‘If I play IPC, then maybe Bala will continue to do so, but if I use Terminator—which would raise my profits this season—Bala would use Terminator next year. So, unless I am extremely impatient for income now, I’d better stick with IPC.’ Bala could reason in exactly the same way. The result might be that they would then continue playing IPC forever. The prisoners’ dilemma is a situation in which there is something to gain for everyone by engaging with others in a common project such as pest control, maintaining an irrigation system, or controlling carbon emissions. But there is also something to lose when others free ride. Even if there is no ongoing relationship, Anil and Bala may choose IPC rather than Terminator because each places a value on the harm imposed on the other. Similar to a prisoners’ dilemma game with more than two people; the dominant strategy is not to contribute to the public good. When students play the one-shot prisoners’ dilemma games in classroom or laboratory experiments (see below)—sometimes for substantial sums of real money—many cooperate rather than opt for the strategy that would give them the best payoff (their dominant strategy). This occurs even though the dominant strategy for players who care only about their own monetary payoffs is to Defect. (In the pest control game, playing Terminator is the Defect strategy and IPC is the Cooperate strategy.) When students played a multi-person version of the one-shot prisoners’ dilemma (the public goods game described in Section 2.6), for example, less than a third consistently defected. What is happening here? One interpretation of these results is that some players are altruistic. For example, if Anil had cared sufficiently about the harm that he would inflict on Bala by using Terminator when Bala was using IPC, then IPC would have been Anil’s best response to Bala’s IPC. And if Bala had felt the same way, then IPC would have been a mutual best response, and the two would no longer have been in a prisoners’ dilemma. Bearing a cost in order to help another person is an altruistic act. A person motivated to do this is said to have ‘altruistic preferences’. If altruistic preferences are common, then social dilemmas may be less common, and will be easier to solve. In the example just given, Anil was willing to give up 1 payoff unit because that would have imposed a loss of 2 on Bala. The cost to him of choosing IPC when Bala had chosen IPC was 1, and it conferred a benefit of 2 on Bala, meaning that he had acted altruistically. If Anil had cared sufficiently about the harm that he would inflict on Bala by using Terminator when Bala was using IPC, then IPC would have been Anil’s best response to Bala’s IPC. And if Bala had felt the same way, then IPC would have been a mutual best response, and the two would no longer have been in a prisoners’ dilemma. There is a lot of evidence, including from neuroscience, that helping others even at a cost to oneself is a source of pleasure for many people. But does this mean that they are actually selfish because they enjoy helping others? No; people who take pleasure in helping others are, by definition, altruistic. The fact that they enjoy it does not detract from the nature of the act. People generally care, not only about what happens to themselves, but also what happens to others. Then we say that the individual has social preferences. Altruism is an example of a social preference. The expression ‘social preference’ sounds like a good thing, but like ‘equilibrium’, this need not be the case—remember, the dominant strategy equilibrium of the prisoners’ dilemma game that Anil and Bala played (about how to combat crop pests) had them both using Terminator and being the worse off for it. Social preferences are not necessarily a good thing. For example, they can take the form of hatred of people of a different race or religion. In this case, the social preference amounts to caring about what happens to others, but negatively, wishing them ill rather than well. You will learn about other kinds of social preferences in the next unit. Paying taxes honestly: One values the help that the resulting revenues will be able to confer on others. Changing one’s lifestyle to help support a better environment: This benefits future generations or for example, people in down-wind affected locations. Cooperating with others to achieve common objectives: These may be a safer more pleasant neighbourhood, or demonstrating for a political cause, even when you would enjoy the benefits whether you participated or not. To understand economic behaviour, we need to know about people’s preferences. Survey questions: To determine political preferences, brand loyalty, degree of trust of others, or religious orientation. Statistical studies of economic behaviour: For example, by measuring how much purchases of two goods change when the relative price varies—to determine preferences for the goods in question. One strategy is to reverse-engineer what the preferences must have been, as revealed by purchases. Surveys have a problem. Asking someone if they like ice cream will probably get an honest answer. But the answer to the question, ‘How altruistic are you?’ may be a mixture of truth, self-advertising, and wishful thinking. Statistical studies cannot control the decision-making environment in which the preferences were revealed, so it is difficult to compare the choices of different groups. This is why economists, along with other social scientists, sometimes use experiments so that people’s behaviour can be observed under controlled conditions. In the next two sections, we report the results of experiments that have been carried out around the world—in the lab and among people facing social dilemmas in their working lives—that provide evidence on how willing people are to make a contribution that will help others at a cost to themselves. Which of the following statements regarding social preferences are correct? Altruism is an example of social preferences. They are the preferences of society as a whole. ‘Keeping up with the Joneses’ is an example of behaviour that could be motivated by social preferences. An individual has social preferences if he cares about inequality in society. Altruism is the willingness to bear a cost in order to benefit somebody else. Therefore, it is an example of social preferences. Social preferences refer to an individual’s preferences. Individuals with social preferences care not only about what happens to themselves, but also to others. Envy is an example of social preferences, and could motivate individuals to ‘keep up with the Joneses’. If an individual cares about what happens to others, then he has social preferences. In contrast to the invisible hand game, self-interest is one reason for the unfortunate outcome in the prisoners’ dilemma game. Now let’s look at the second reason; there was no way that either Anil or Bala (or anyone else) could make whoever used the insecticide pay for the harm that it caused. The problems of Anil and Bala are hypothetical, but they capture the real dilemmas of free riding that many people around the world face. Take the case of climate change. The benefits of slowing global warming will be widely shared, but people will benefit even if they make no contribution themselves to reducing carbon emissions. At a more local level, as in Spain, many farmers in Southeast Asia rely on a shared irrigation facility to produce their crops. The system requires constant maintenance and new investment. Each farmer faces the decision of how much to contribute to these activities. These activities benefit the entire community and if the farmer does not volunteer to contribute, others may do the work anyway. Imagine there are four farmers who are deciding whether to contribute to the maintenance of an irrigation project. For each farmer, the cost of contributing to the project is $10. But when one farmer contributes, all four of them will benefit from an increase in their crop yields made possible by irrigation, so they will each gain $8. Contributing to the irrigation project is called a public good—when one individual bears a cost to provide the good, everyone receives a benefit. As an example, let’s focus on one of the farmers, called Kim. If two of the others contribute, Kim will receive a benefit of $8 from each of their contributions. If she makes no contribution herself, her total payoff is $16. 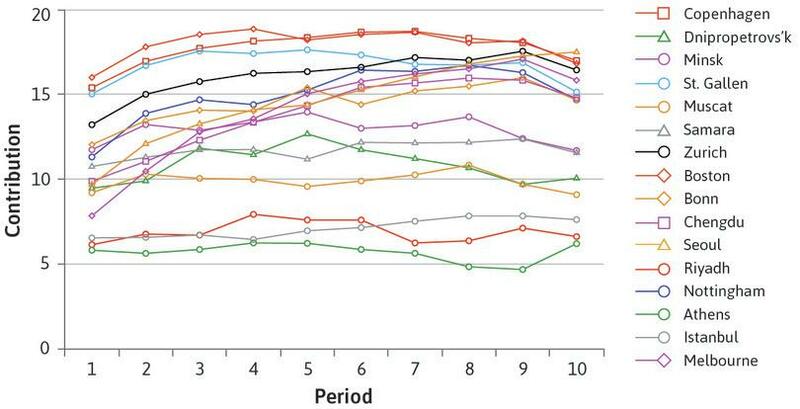 This is shown in the top row of Figure 2.6 and by the red bar with ‘16’ on top in Figure 2.7. If she decides to contribute, she will receive an additional benefit of $8 (and so will the other three farmers). But she will incur a cost of $10, so her total payoff is $14, as shown by the blue bar with ‘14’ on top in Figure 2.7, and as calculated in Figure 2.6. Example: When two others contribute, Kim’s payoff is lower if she contributes too. Figure 2.6 Example: When two others contribute, Kim’s payoff is lower if she contributes too. Now, when Kim makes her decision, she has the information shown in Figure 2.7. This shows how her decision depends on her total earnings, but also on the number of other farmers who decide to contribute to the irrigation project. Note that the red bars are all higher than the blue ones—when Kim contributes, she earns less than when she free rides. This is a social dilemma. Kim’s payoffs in the public goods game. Figure 2.7 Kim’s payoffs in the public goods game. Whatever the other farmers decide to do, Kim makes more money if she doesn’t contribute than if she does. Not contributing is a dominant strategy. She can free ride on the contributions of the others. This public goods game is a prisoners’ dilemma in which there are more than two players. 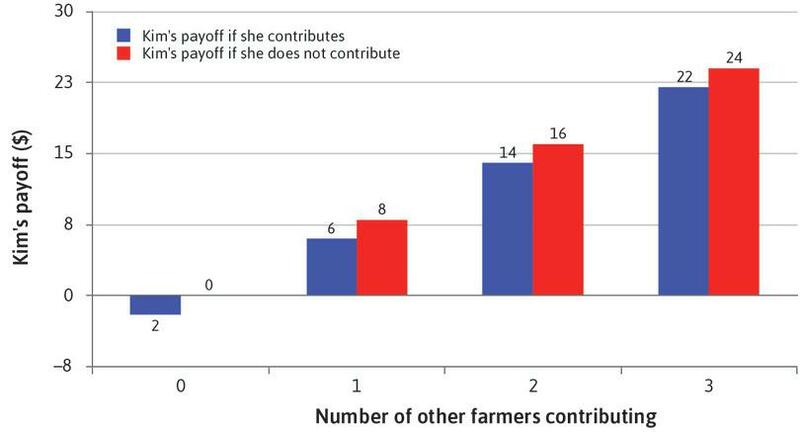 If the farmers care only about their own monetary payoff, there is a dominant strategy equilibrium in which no one contributes and their payoffs are all zero (as shown in Figure 2.7). On the other hand, if all contributed, each would get $22. Everyone would benefit if everyone cooperated, but irrespective of what others do, each farmer does better by free riding on the others. Altruism could help to solve the free rider problem—if Kim cared about the other farmers, she might be willing to contribute to the irrigation project. But if large numbers of people are involved in a public goods game, it is less likely that altruism will be sufficient to sustain a mutually beneficial outcome. 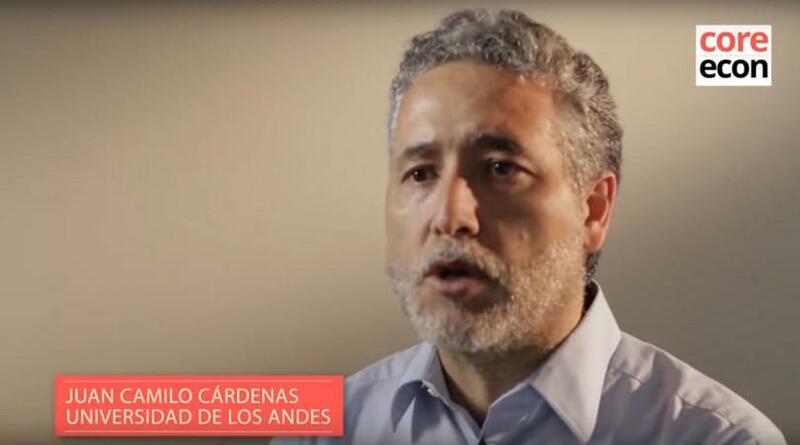 In our ‘Economist in action’ video, Juan Camilo Cárdenas, an economist at the Universidad de los Andes in Bogotá, Colombia, talks about his use of experimental economics in real-life situations. He performs experiments about social dilemmas with people who are facing similar problems to the farmer, Kim, such as overexploitation of a forest or a fish stock. Behavioural experiments have become important in the empirical study of preferences. Part of the motivation for economists undertaking experiments is that understanding someone’s motivations (altruism, reciprocity, inequality aversion as well as self-interest) is essential to being able to predict how they will behave as employees, family members, custodians of the environment, and citizens. Decisions have consequences: The decisions in the experiment may decide how much money the subjects earn by taking part. Sometimes the stakes can be as high as a month’s income. Instructions and rules are common to all subjects: There is also a common treatment. This means that if we want to compare two groups, the only difference between the control and treatment groups is the treatment itself, so that its effects can be identified. Experiments can be replicated: They are designed to be implementable with other groups of participants. Experimenters attempt to control for other possible explanations: Other variables are kept constant wherever possible, because they may affect the behaviour we want to measure. This means that, when people behave differently in the experiment, it is likely due to differences in their preferences, not in the situation that each person faces. Economists have discovered that the way people behave in experiments can be used to predict how they react in real-life situations. For example, fishermen in Brazil who acted more cooperatively in an experimental game also practised fishing in a more sustainable manner than the fishermen who were less cooperative in the experiment. In Exercise 2.4, however, Stephen Levitt and John List ask whether people would behave the same way in the street as they do in the laboratory. Exercise 2.4 Are lab experiments a good guide to what people do? In 2007, Steven Levitt and John List published a paper called ‘What Do Laboratory Experiments Measuring Social Preferences Reveal about the Real World?’.10 Read pages 158–171 of their paper (note that some of the language in the article is technical, and knowledge of it is not essential for answering the question). According to their paper, why and how might people’s behaviour in real life vary from what has been observed in laboratory experiments? 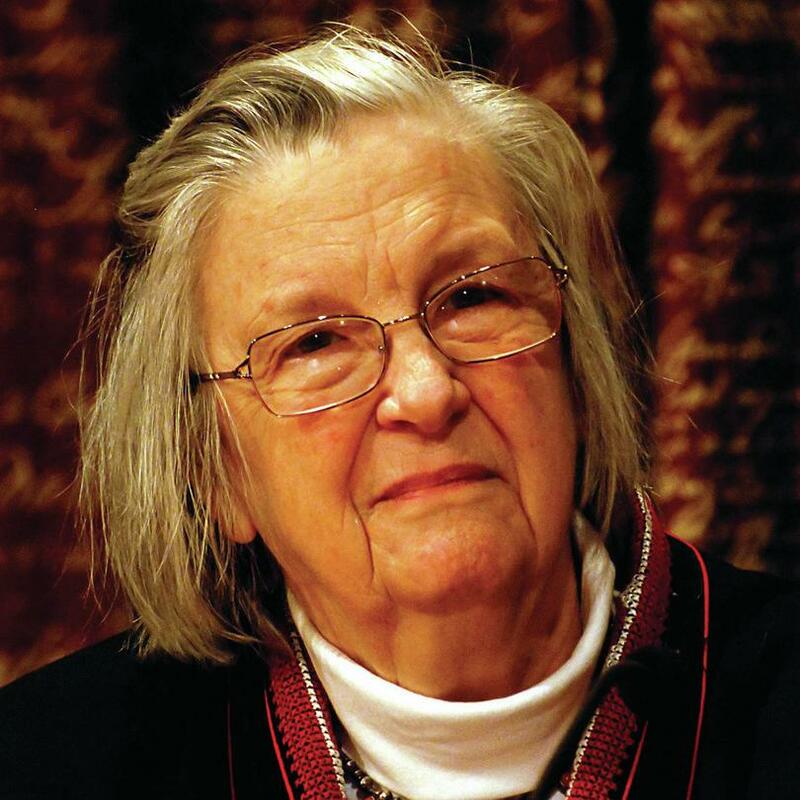 The choice of Elinor Ostrom (1933–2012), a political scientist, as a co-recipient of the 2009 Nobel Prize surprised most economists. For example, Steven Levitt, a professor at the University of Chicago, admitted he knew nothing about her work, and had ‘no recollection of ever seeing or hearing her name mentioned by an economist’. Some, however, vigorously defended the decision. Vernon Smith, an experimental economist who had previously been awarded the Prize, congratulated the Nobel committee for recognizing her originality, ‘scientific common sense’, and willingness to ‘listen carefully to data’. Ostrom’s entire academic career was focused on exploring the middle ground in an economy where communities, rather than individuals or formal governments, held property rights. The conventional wisdom at the time was that informal collective ownership of resources would lead to a tragedy of the commons. That is, economists believed that resources could not be used efficiently and sustainably under a common property regime. Thanks to Elinor Ostrom, this is no longer a dominant view. Common property involves a well-defined community of users who are able in practice, if not under the law, to prevent outsiders from exploiting the resource. Inshore fisheries, grazing lands, or forest areas are examples. Open-access resources such as ocean fisheries or the atmosphere as a carbon sink, can be exploited without restrictions, other than those imposed by states acting alone or through international agreements. Concentrating on common property, Ostrom drew on a unique combination of case studies, statistical methods, game theory models, and laboratory experiments to try to understand how tragedies of the commons could be averted. She discovered great diversity in how common property is managed. Some communities were able to devise rules and draw on social norms to enforce sustainable resource use, while others failed to do so. Much of her career was devoted to identifying the criteria for success and using theory to understand why some arrangements worked well, while others did not. Ostrom knew that sustainable use of common property was enforced by actions that clearly deviated from the hypothesis of self-interest. In particular, individuals would willingly bear considerable costs to punish those who violated rules or norms. Ostrom developed simple game theory models in which individuals have unorthodox preferences, such as caring about trust and reciprocity. She also looked for the ways in which people faced with a social dilemma avoided tragedy by changing the rules so that the strategic nature of the interaction was transformed. She worked with economists to run a pioneering series of experiments, confirming the widespread use of costly punishment in response to excessive resource extraction. Her work also demonstrated the power of communication and the critical role of informal agreements in supporting cooperation. Social preferences like altruism partly explain why some communities avoid Garrett Hardin’s tragedy of the commons. But communities may also find ways of deterring free-riding behaviour by punishing those who do not contribute, as Elinor Ostrom found. To better understand this, we will look in the next section at evidence of how people behave when playing experimental games. According to Elinor Ostrom, which of the following statements about the problem of the tragedy of the commons are correct? Even if all individuals were completely selfish, repeated games would definitely result in cooperative outcomes. Agreements for cooperation must be enforced by governments. Individuals care about trust and reciprocity. Social norms can be drawn on to enforce sustainable resources, although it does not always succeed. Repeated games predict that any outcome can be sustained indefinitely, including the rapid depletion outcome. Therefore, a cooperative outcome is not guaranteed. Ostrom disagreed with this, arguing that covenants make self-governance possible. Ostrom assumed that individuals have unorthodox preferences, caring about trust and reciprocity. This is one of the findings of Ostrom’s work. Free riding today on the contributions of other members of one’s community may have unpleasant consequences tomorrow or years from now. This is relevant to a wide range of social dilemmas, ranging from global ones like climate change and public health (for example antibiotic resistance and compliance with vaccination programmes for communicable diseases), to local dilemmas like the development of land on flood plains. An experiment demonstrates that people can sustain high levels of cooperation in a public goods game, as long as they have opportunities to punish free riders once it becomes clear who is contributing less than the norm. Participants play ten rounds of a public goods game, similar to the one involving Kim and the other farmers that we just described. In each round, the people in the experiment (we call them subjects) are given $20. They are randomly sorted into small groups, typically of four people who don’t know each other. They are asked to decide on a contribution from their $20 to a common pool of money. The pool is a public good. For every dollar contributed, each person in the group receives $0.40, including the contributor. Imagine that you are playing the game and you expect the other three members of your group to each contribute $10. If you don’t contribute, you will get $32 (three returns of $4 from their contributions, plus the initial $20 that you keep). The others have paid $10, so they only get $32 − $10 = $22 each. If you contribute $10, then everyone, including you, will get $22 + $4 = $26. Unfortunately for the group, you do better by not contributing because the reward for free riding ($32) is greater than for contributing ($26). And, unfortunately for you, the same applies to each of the other members. After each round, the participants are told the contributions of other members of their group. In Figure 2.8a, each line represents the evolution over time of average contributions in a different location around the world. People are definitely not solely self-interested. If they were, and reasoned that everyone else was also self-interested, then they would not contribute. Worldwide public goods experiments: Contributions over 10 periods. 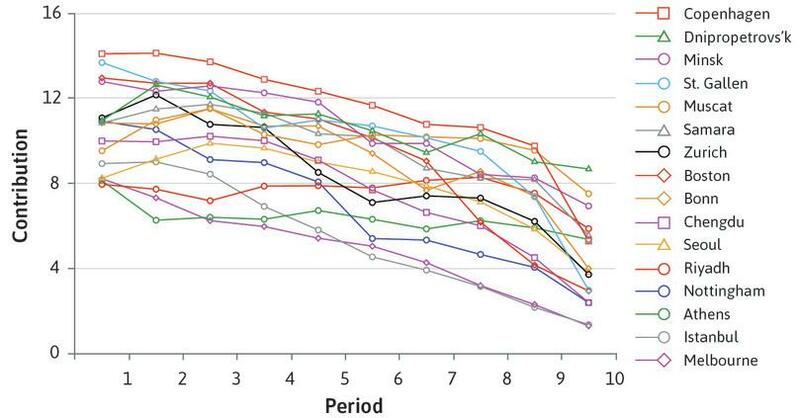 Figure 2.8a Worldwide public goods experiments: Contributions over 10 periods. Benedikt Herrmann, Christian Thoni, and Simon Gachter. 2008. ‘Antisocial Punishment Across Societies’. Science 319 (5868): pp. 1362–67. As you can see, players in Chengdu contributed $10 in the first round, just as we described above. In every population where the game was played, contributions to the public good were high in the first period, although much more so in some cities (Copenhagen) than in others (Melbourne). This is remarkable—if you care only about your own payoff, contributing nothing at all is the dominant strategy. The high initial contributions could have occurred because the participants in the experiment valued their contribution to the payoffs that others received (they were altruistic). But the difficulty (or, as Hardin would have described it, the tragedy) is obvious. Everywhere, the contributions to the public good decreased over time. Nevertheless, the results also show that, despite a large variation across societies, most of them still have high contribution levels at the end of the experiment. The most plausible explanation of the pattern is not altruism. It is likely that contributors decreased their level of cooperation if they observed that others were contributing less than expected and were therefore free riding on them. It seems as if those people who contributed more than the average liked to punish the low contributors for their unfairness, or for violating a social norm of contributing. Since the payoffs of free riders depend on the total contribution to the public good, the only way to punish free riders in this experiment was to stop contributing. This is the tragedy of the commons. Many people are happy to contribute, as long as others reciprocate. A disappointed expectation of reciprocity is the most convincing reason that contributions fell so regularly in later rounds of this game. To test this, the experimenters took the public goods game experiment shown in Figure 2.8a and introduced a punishment option. After observing the contributions of their group, individual players could pay to punish other players by making them pay a $3 fine. The punisher remained anonymous but had to pay $1 per player punished. The effect is shown in Figure 2.8b. For the majority of subjects, including those in China, South Korea, northern Europe, and the English-speaking countries, contributions increased when they had the opportunity to punish free riders. Worldwide public goods experiments with opportunities for peer punishment. Figure 2.8b Worldwide public goods experiments with opportunities for peer punishment. People who think that others have been unfair or have violated a social norm may retaliate, even if the cost to themselves is high. Their punishment of others is a form of altruism, because it costs them something to help deter free-riding behaviour that is detrimental to the wellbeing of most members of the group. This experiment illustrates the way that, even in large groups of people, a combination of repeated interactions and social preferences can support high levels of contribution to the public good. The public goods game, like the prisoners’ dilemma, is a situation in which there is something to gain for everyone by engaging with others in a common project, such as controlling carbon emissions, pest control, and maintaining fish stocks. But there is also something to lose when others free ride. 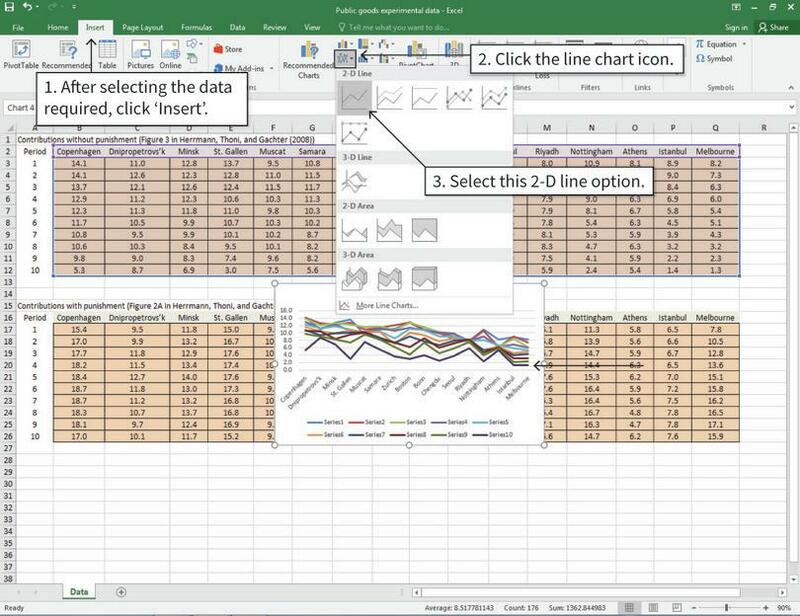 In this exercise, you will be using Excel to take a closer look at how contributions in the public goods experiments (shown in Figures 2.8a and 2.8b) have changed over the course of the game and after punishment was introduced. 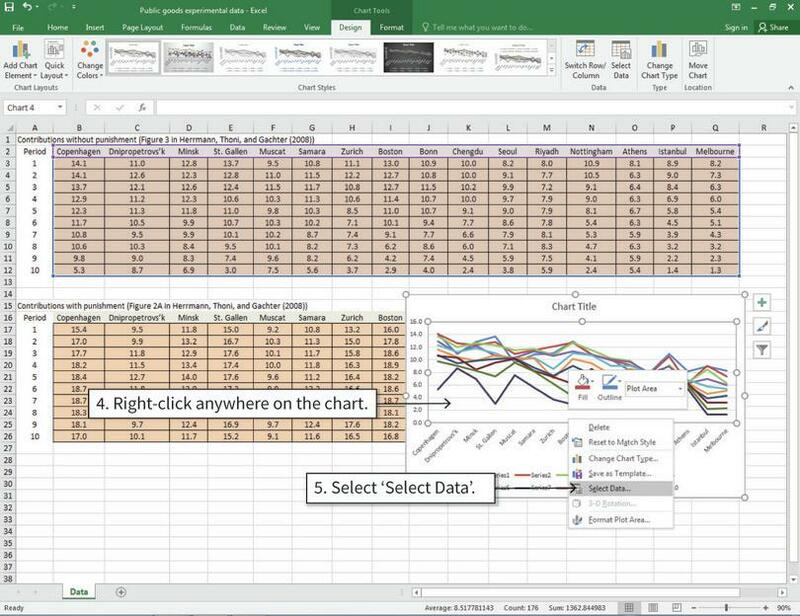 Download and save the spreadsheet containing the data for Figures 2.8a and 2.8b. Choose one figure (either 2.8a or 2.8b) and use the data to plot a line chart with contribution on the vertical axis and period on the horizontal axis. 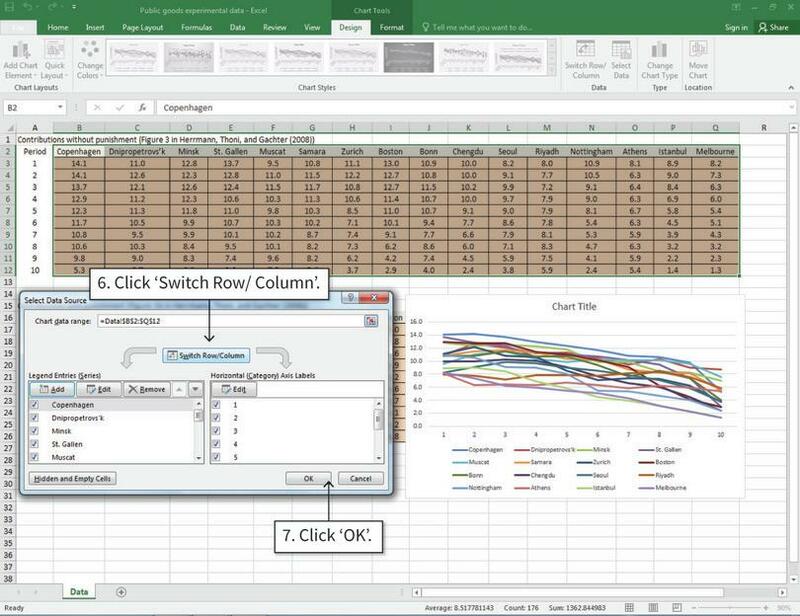 Follow the walk-through in Figure 2.9 below on how to do this in Excel. Plotting a line chart with multiple variables. Figure 2.9 Plotting a line chart with multiple variables. This is what the data looks like. Each column has data for a particular country, and each row has data for a given time period (1 to 10). We will draw Figure 2.8a as an example; the steps to do Figure 2.8b are identical. Figure 2.9a This is what the data looks like. Each column has data for a particular country, and each row has data for a given time period (1 to 10). We will draw Figure 2.8a as an example; the steps to do Figure 2.8b are identical. After completing step 3, the chart will look like this. 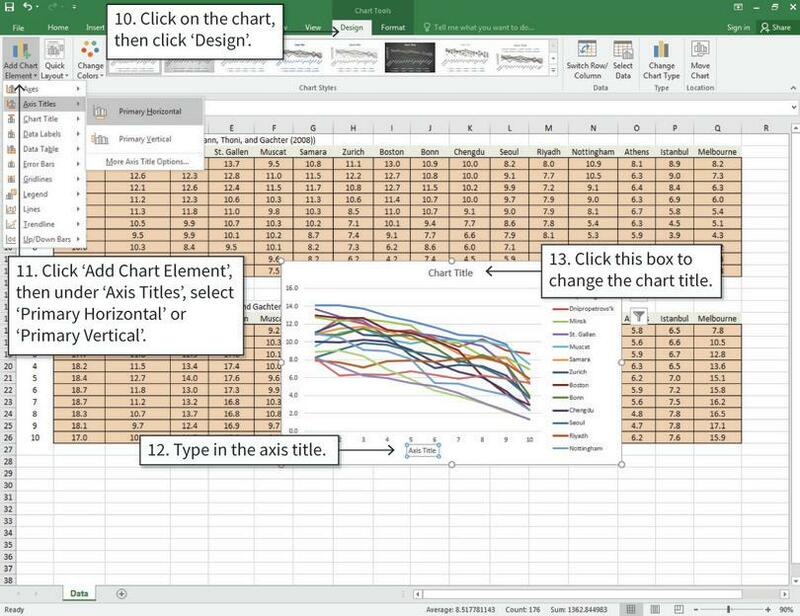 Notice that the horizontal axis variable and vertical axis variables are not the same as Figure 2.8a (due to Excel’s default setting). Figure 2.9b After completing step 3, the chart will look like this. 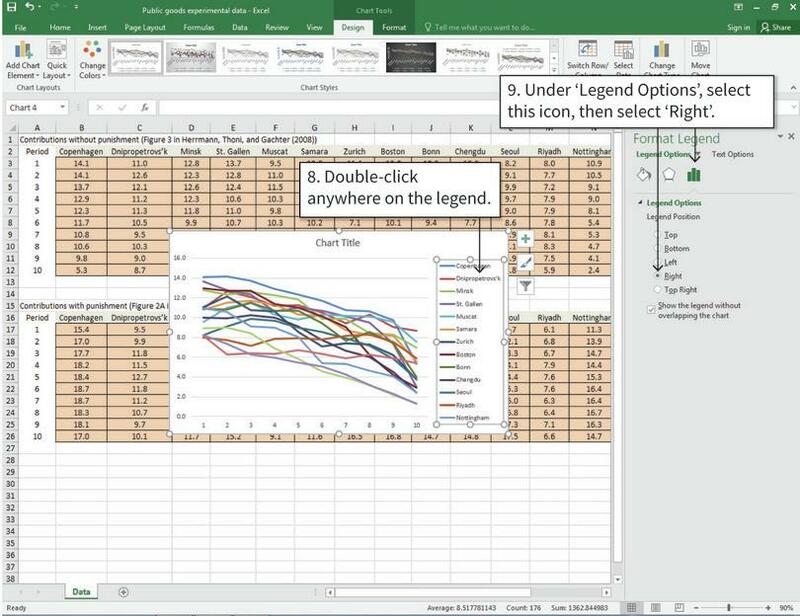 Notice that the horizontal axis variable and vertical axis variables are not the same as Figure 2.8a (due to Excel’s default setting). We can switch the horizontal and vertical axis variables in the ‘Select Data’ options. Figure 2.9c We can switch the horizontal and vertical axis variables in the ‘Select Data’ options. After step 7, the lines on your chart will look like those in Figure 2.8a or Figure 2.8b. Figure 2.9d After step 7, the lines on your chart will look like those in Figure 2.8a or Figure 2.8b. After step 9, the legend will now be on the right-hand side of your chart. You can also experiment with the other positions to see which looks better. Figure 2.9e After step 9, the legend will now be on the right-hand side of your chart. You can also experiment with the other positions to see which looks better. After step 13, your chart will look like Figure 2.8a or Figure 2.8b. Figure 2.9f After step 13, your chart will look like Figure 2.8a or Figure 2.8b. For Figure 2.8a, calculate the difference between the starting and ending values. Which country had the largest/smallest change in contributions after ten periods? Do the same for Figure 2.8b. Did contributions increase, decrease, or stay the same when players could punish each other? Now choose three countries in the data. Calculate and compare the difference between contributions in the game with and without punishment. Did subjects in your chosen countries contribute more in every period when there was punishment? Why would it be reasonable to think that the differences we see are due to the punishment option, rather than other explanations? Consider the public goods experiment without peer punishment. Based on the information shown in Figure 2.8a, which of the following statements is correct? The evidence suggests that playing only one round ensures high contributions. The results prove that subjects are completely selfish. A disappointed expectation of reciprocity may be the reason for the falling contributions over the rounds. Repeating the game makes the subjects more altruistic in later rounds. This is uncertain. The fact that the subjects know that there are ten rounds may lead to high first-round contributions. Sudden drops in the last round contributions in many locations (for example Copenhagen, Bonn, and St. Gallen) may be because they know that it was the final round. If the subjects were completely selfish, then their dominant strategy is not to contribute at all in every round. This may be the reason why the contributions fall; those contributing more than the average may be punishing the low contributors for violating a social norm of contributing by not contributing themselves. The contributions gradually fall over the rounds. In the games we have been looking at until now, players could do as well as possible (get the highest payoff) regardless of what the other player did. There was a dominant strategy for each player, and hence a single dominant strategy equilibrium. This was true of the invisible hand game, the prisoners’ dilemma, and public goods games. But this is often not the case. We have already mentioned a situation in which it is definitely untrue—driving on the right or on the left. If others drive on the right, your best response is to drive on the right too. If they drive on the left, your best response is to also drive on the left. To predict what we will observe, even when there is no dominant strategy equilibrium, we need to extend our understanding of game theory. In the US, everyone driving on the right is an equilibrium, in the sense that no one would want to change their strategy given what others are doing. In game theory, if everyone is playing their best response to the strategies of everyone else, these strategies are termed a Nash equilibrium. In Japan, though, driving on the left is a Nash equilibrium. The driving ‘game’ has two Nash equilibria. Many economic interactions do not have dominant strategy equilibria, but if we can find a Nash equilibrium, it gives us a prediction of what we should observe. We should expect to see all players doing the best they can, given what others are doing. Even in simple economic problems, there may be more than one Nash equilibrium (as in the driving game). Suppose that, when Bala and Anil choose their crops, the payoffs are as shown in Figure 2.10. This is different from the invisible hand game. If the two farmers produce the same crop, there is now such a large fall in price that it is better for each to specialize, even in the crop they are less suited to grow. Follow the steps in Figure 2.10 to find the two equilibria. A division of labour problem with more than one Nash equilibrium. Figure 2.10 A division of labour problem with more than one Nash equilibrium. If Bala is going to choose Rice, Anil’s best response is to choose Cassava. We place a dot in the bottom left-hand cell. Figure 2.10a If Bala is going to choose Rice, Anil’s best response is to choose Cassava. We place a dot in the bottom left-hand cell. If Bala is going to choose Cassava, Anil’s best response is to choose Rice. Place a dot in the top right-hand cell. Notice that Anil does not have a dominant strategy. Figure 2.10b If Bala is going to choose Cassava, Anil’s best response is to choose Rice. Place a dot in the top right-hand cell. Notice that Anil does not have a dominant strategy. If Anil chooses Rice, Bala’s best response is to choose Cassava, and if Anil chooses Cassava, he should choose Rice. The circles show Bala’s best responses. He doesn’t have a dominant strategy either. Figure 2.10c If Anil chooses Rice, Bala’s best response is to choose Cassava, and if Anil chooses Cassava, he should choose Rice. The circles show Bala’s best responses. He doesn’t have a dominant strategy either. If Anil chooses Cassava and Bala chooses Rice, both are playing best responses (a dot and a circle coincide). This is a Nash equilibrium. Figure 2.10d If Anil chooses Cassava and Bala chooses Rice, both are playing best responses (a dot and a circle coincide). This is a Nash equilibrium. If Anil chooses Rice and Bala chooses Cassava, then both are playing best responses, so this is also a Nash equilibrium, but the payoffs are higher in the other equilibrium. 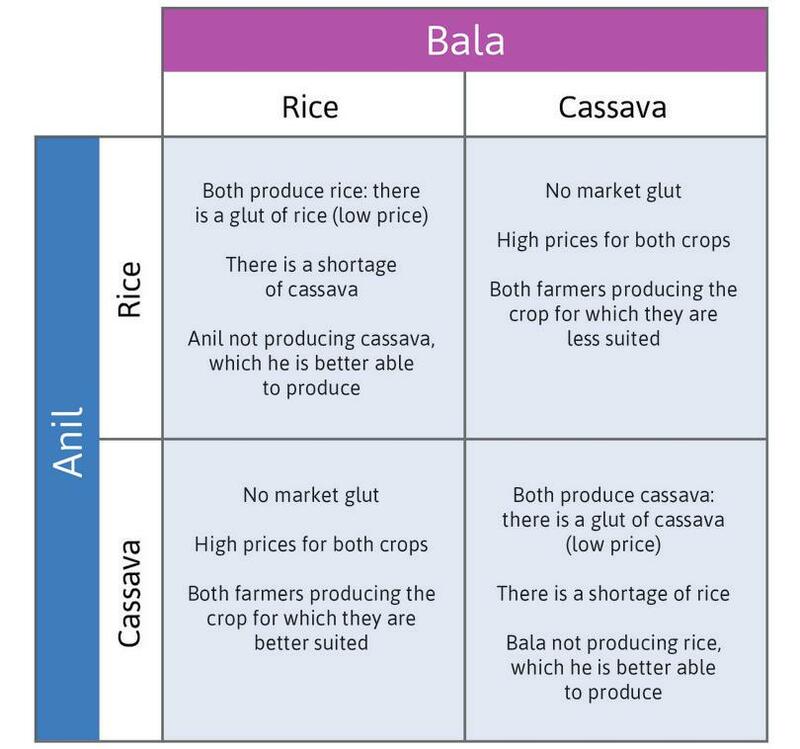 Figure 2.10e If Anil chooses Rice and Bala chooses Cassava, then both are playing best responses, so this is also a Nash equilibrium, but the payoffs are higher in the other equilibrium. Each player’s best response does not depend on what the other player does: Unlike in Figure 2.10, the dots are always in the same row, and the circles are always in the same column. There is only one equilibrium. Which of the following statements regarding Nash equilibrium are correct? No player has an incentive to deviate from a Nash equilibrium. In a Nash equilibrium, all players choose their best response strategy given the other players’ strategies. A Nash equilibrium is a dominant strategy equilibrium. A dominant strategy equilibrium is a Nash equilibrium. As all players choose their best response to the other players’ strategies, each player has no incentive to deviate. This is the definition of Nash equilibrium. In a Nash equilibrium, the players choose their best response strategy given the other players’ strategies. This strategy is not necessarily a dominant strategy (in some cases, a dominant strategy may not even exist). Therefore, a Nash equilibrium may not be a dominant strategy equilibrium. A dominant strategy is the best response to all strategies by the other players. A dominant strategy equilibrium therefore must be a Nash equilibrium. The invisible hand: Anil and Bala chose their crops in pursuit of their own interests. Their engagement in the village market resulted in a mutually beneficial division of labour where each specialized in the crop they were better at producing, and as a result, their incomes were higher than they would have been if they had not interacted through the market. The repeated prisoners’ dilemma: When there is an ongoing relationship in the pest control game, Anil and Bala may refrain from using Terminator because they recognize the future losses they would suffer as a result of abandoning IPC. The public goods game: Players’ willingness to punish others led to sustained high levels of cooperation in the experiments in many countries, without the need for agreements. This is called a cooperative outcome. Cooperation means participating in a common project in such a way that mutual benefits occur and, unlike in everyday language, cooperation need not be based on an agreement. In other cases, such as the one-shot prisoners’ dilemma, we have seen that independent actions led to an unfortunate outcome. In these cases, the players could do better if they could reach an agreement. People commonly try to do just this—they resort to negotiation to solve their economic and social problems. For example, international negotiation resulted in the Montreal Protocol, mentioned above, through which countries agreed to eliminate the use of chlorofluorocarbons (CFCs) in order to avoid a harmful outcome (the destruction of the ozone layer). But negotiation does not always succeed, sometimes because of conflicts of interest over how the mutual gains of cooperation will be shared. The success of the Montreal Protocol in reducing the use of CFCs contrasts with the relative failure of the Kyoto Protocol and of the 2009 Copenhagen climate change summit. The reasons are partly scientific. The alternative technologies to CFCs were well developed and the benefits relative to costs for large industrial countries, such as the US, were much clearer and larger than in the case of greenhouse gas emissions. But one of the obstacles to agreement at the Copenhagen summit in 2009 was over how to share the costs and benefits of limiting emissions between developed and developing countries. The tools of game theory can help explain these different outcomes. Which equilibrium would we expect to observe in the world? Is there a conflict of interest because one equilibrium is preferable to some players, but not to others? Whether you drive on the right or the left can be represented as a game with two Nash equilibria—everybody left, or everybody right. Which it will be is not a matter of conflict in itself, as long as everyone you are driving towards has made the same decision as you. We can’t say that driving on the left is better for anyone, or for people in general, than driving on the right. But in the division of labour game in Figure 2.10, it is clear that the Nash equilibrium with Anil choosing Cassava and Bala choosing Rice (where they specialize in the crop they produce best) is preferred by both farmers to the other Nash equilibrium. Could we say, then, that we would expect to see Anil and Bala engaged in the ‘correct’ division of labour? Not necessarily. Remember, we are assuming that they take their decisions independently, without coordinating. Imagine that Bala’s father had been especially good at growing cassava (unlike his son) and so the land remained dedicated to cassava even though it was better suited to producing rice. In response to this, Anil knows that Rice is his best response to Bala’s Cassava, and so would have then chosen to grow rice. Bala would have no reason to switch to what he is good at—growing rice. The example makes an important point. If there is more than one Nash equilibrium, and if people choose their actions independently, then an economy can get ‘stuck’ in a Nash equilibrium in which all players are worse off than they would be in the other equilibrium. Later in the course, we will see that this model helps explain phenomena like an economy getting stuck in a situation with low investment and high unemployment. 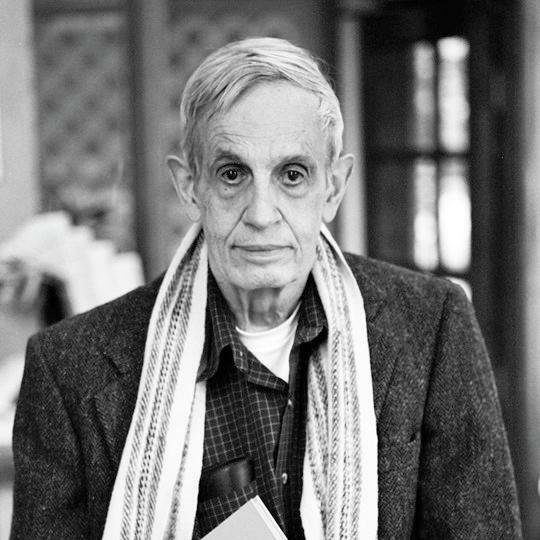 John Nash (1928–2015) completed his doctoral thesis at Princeton University at the age of 21. It was just 27 pages long, yet it advanced game theory (which was a little-known branch of economics back then) in ways that led to a dramatic transformation of the subject. He provided an answer to the question, ‘When people interact strategically, what would one expect them to do?’. His answer, now known as a Nash equilibrium, is a collection of strategies, one for each player, such that if these strategies were to be publicly revealed, no player would regret his or her own choice. That is, if all players choose strategies that are consistent with a Nash equilibrium, then nobody can gain by unilaterally switching to a different strategy. Nash did much more than simply introduce the concept of an equilibrium, he proved that such an equilibrium exists under very general conditions, provided that players are allowed to randomize over their available set of strategies. To see the importance of this, consider the two-player children’s game, rock–paper–scissors. If each of the players picks one of the three strategies with certainty, then at least one of the players would be sure to lose and would therefore have been better off choosing a different strategy. But if both players choose each available strategy with equal probability, then neither can do better by randomizing over strategies in a different way. This is accordingly a Nash equilibrium. There is hardly a field in economics that the development of game theory has not completely transformed, and this development would have been impossible without Nash’s equilibrium concept. Remarkably, this was not Nash’s only path-breaking contribution to economics—he also made a brilliantly original contribution to the theory of bargaining. In addition, he made pioneering contributions to other areas of mathematics, for which he was awarded the prestigious Abel Prize. For much of his life, Nash suffered from mental illness that required hospitalization. He experienced hallucinations caused by schizophrenia that began in 1959. After what he described as ‘25 years of partially deluded thinking’, he continued his teaching and research at Princeton. The story of his insights and illness are told in the book (made into a film starring Russell Crowe), A Beautiful Mind. Which of the following statements regarding Nash equilibrium is correct? In a game where players are only allowed to select one strategy, if a Nash equilibrium exists, then it is unique. In a game where players are only allowed to select one strategy, a Nash equilibrium may not exist. In a game where players are allowed to randomize between strategies, if a Nash equilibrium exists, then it is unique. In a game where players are allowed to randomize between strategies, a Nash equilibrium may not exist. A coordination game (for example choosing which side of the road to drive on) has two Nash equilibria. This is true in the rock-paper–scissors game. If I choose Rock, then your best response strategy is Paper, but my Rock is not the best response strategy to your Paper. This is true for any pair of strategies. A pure strategy Nash equilibrium (where players are only allowed to select one strategy) is an extreme case of a mixed strategy Nash equilibrium (where players are allowed to randomize). A coordination game has two pure strategy Nash equilibria (and therefore two extreme cases of mixed strategy Nash equilibria). John Nash proved that a Nash equilibrium always exists if randomization is permitted. For example, in the rock–paper–scissors game, each player choosing each strategy with equal probability is a Nash equilibrium. So far, the problem facing our players has been to avoid getting trapped in an equilibrium that is worse for both, or all players. They experience mutual gains if they can cooperate and find a way to move to a different, mutually preferred outcome. But players face other problems. When there is more than one equilibrium in a game, a conflict of interest occurs if players in a game would prefer different Nash equilibria. There may be mutual gains to getting to one or the other of these equilibria, but who gets the lion’s share of these gains may differ among the outcomes. Think of a couple in love but capable of only rudimentary speech in the other’s native language. Which one is going to learn the other’s language? Both speaking Greek and both speaking German are Nash equilibria, and both are preferable to neither learning the other’s language, but they will probably differ in which each would prefer. This fact underlies one of the key lessons of economics—when people interact, they may each benefit compared to what they could have had acting singly, but they will also face a conflict over who benefits more. To see this, consider the case of Astrid and Bettina, two software engineers who are working on a project for which they will be paid. Their first decision is whether the code should be written in Java or C++ (imagine that either programming language is equally suitable, and that the project can be written partly in one language and partly in the other, although this would slow down their work). Astrid wants to write in Java because she is better at writing Java code. While this is a joint project with Bettina, her pay will be partly based on how many lines of code were written by her. Unfortunately, Bettina prefers C++ for the same reason. The two strategies are therefore called Java and C++. Their interaction is described in Figure 2.11a, and their payoffs are in Figure 2.11b. Interactions in the choice of programming language. Figure 2.11a Interactions in the choice of programming language. They both do better if they work in the same language. Astrid does better if the language is Java, while the reverse is true for Bettina. Their total payoff is higher if they choose C++. How would we predict the outcome of this game? Payoffs (thousands of dollars to complete the project) according to the choice of programming language. Figure 2.11b Payoffs (thousands of dollars to complete the project) according to the choice of programming language. If you use the dot-and-circle method, you will find that each player’s best response is to choose the same language as the other player. In other words, there are two Nash equilibria. In one, both choose Java. In the other, both choose C++. Can we say which of these two equilibria is more likely to occur? Astrid obviously prefers that they both play Java while Bettina prefers that they both play C++. With the information we have about how the two might interact, we can’t yet predict what would happen. Which of the two has more power? For example, if Astrid is Bettina’s boss, they will probably end up using Java. Who started work on the project first? If Bettina has completed part of the project before her co-worker Astrid is brought onto the team, then they will probably continue with C++. Astrid can choose which language she will use first, and commit to it (just as the Proposer in the ultimatum game commits to an offer, before the Responder responds). The two can make an agreement, including which language they use, and the size of a cash transfer from one to the other. They have been working together for many years, and in the past they used Java on joint projects. Anthony loves going to the opera while Becky loves watching football. Figure 2.12 is the payoff table for their choice of activity. Figure 2.12 Opera or football? For example, if Anthony chooses opera and Becky chooses football, then the activities are valued at £10 to Anthony and £20 to Becky. Assume that they can only choose one activity (in other words, they cannot randomize). Based on this information, which of the following statements is correct? There are two Nash equilibria: (Opera, Opera) and (Football, Football). If Anthony offers £20 to Becky for coming to the opera with him, then (Opera, Opera) may be chosen. If Anthony offers £50 to Becky for coming to the opera with him, then (Opera, Opera) will definitely be chosen. If Anthony announces that he will choose opera and sticks to it, then (Opera, Opera) will be chosen. If Anthony chooses opera, then Becky is better off choosing football. Therefore (Opera, Opera) is not a Nash equilibrium. With the payoff (60, 30) for (Opera, Opera), it now becomes a Nash equilibrium, so it may be chosen. However, (Football, Football) remains a Nash equilibrium and therefore, without coordination beforehand, there is no certainty that (Opera, Opera) will be chosen. With the payoff of (30, 60) for (Opera, Opera), it is now a Nash equilibrium. However, (Football, Football) remains a Nash equilibrium and therefore, without coordination beforehand, there is no certainty that (Opera, Opera) will be chosen. Even if Anthony announces and sticks to opera, Becky’s best response is to choose football. So (Opera, Opera) would never be chosen. Conflicts between countries can be modelled in a manner similar to Astrid and Bettina’s differing preferences about the coding language. Here is an example, starting with a little background. This is the blunt beginning of the executive summary of the Stern Review on the Economics of Climate Change, released in 2006. The British Chancellor of the Exchequer (finance minister) commissioned a group of economists, led by Nicholas (now Lord) Stern, the former Chief Economist of the World Bank, to assess the evidence for climate change and to try to understand its economic implications. The Stern Review concludes that the benefits of early action to slow climate change will outweigh the costs of neglecting the issue. However, this will not happen if we pursue what Stern referred to as ‘business as usual’—a scenario in which people, governments, and businesses are free to pursue their own pleasures, politics, and profits without taking adequate account of the effect of their actions on others, including future generations. National governments disagree on the policies that should be adopted. Many nations in the developed world are pressing for strict global controls on carbon emissions; others have resisted these measures. Think of the problem as a game between two countries, China and the US, considered as if each were a single individual. We do this to show that, depending on how the game is structured and the objectives of the participants, the outcomes may be very different. Each country has two possible strategies for addressing global carbon emissions: Restrict (taking measures to reduce emissions, for example by taxing the use of fossil fuels) and BAU. BAU stands for ‘business as usual’, the strategy of not introducing policies to cut emissions. Figure 2.13a describes the outcomes (top) and hypothetical payoffs (bottom), on a scale from best, through good and bad, to worst. This is called an ordinal scale because all that matters is the order—whether one outcome is better than the other—and not by how much it is better. The climate change game: Outcomes from the two strategies, Restrict and Business as usual (BAU). Figure 2.13a The climate change game: Outcomes from the two strategies, Restrict and Business as usual (BAU). The worst outcome for both countries is that both persist with BAU, running a significant risk of human (and many other species’) extinction. The best for each is to continue with BAU and let the other one Restrict. The only way to moderate climate change significantly is for both to Restrict. A game in which there is conflict (when hawks meet), sharing (when doves meet), and taking (by a hawk when it meets a dove). One possible set of numerical payoffs for this game is illustrated in Figure 2.13b (bottom). We work through the game to find the predicted outcome. The climate change hawk–dove game: Payoffs from the two strategies of Restrict and BAU (Business as usual). Figure 2.13b The climate change hawk–dove game: Payoffs from the two strategies of Restrict and BAU (Business as usual). First, consider China, the row player. If the US plays Restrict, then China’s best response is BAU—place a dot in the bottom left cell. If the US plays BAU, then China, fearing human extinction, selects Restrict—place a dot in the top right cell. It is clear from this that China does not have a dominant strategy: what is best for China depends on what the US does. By inspecting the payoff matrix, we can see that the game is symmetric. The same is true of the US—if China Restricts, the US will carry on with BAU. 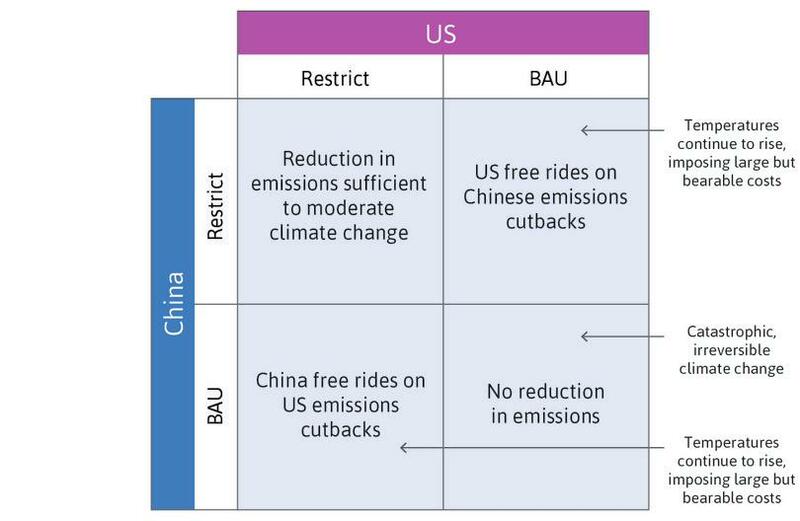 If China continues with BAU, then (like China in the previous case, fearing cataclysmic climate change for the entire planet) the US will Restrict. The circles will be in the bottom left and top right cells. Neither country has a dominant strategy. There are two Nash equilibria: They differ on which country bears the cost of restricting emissions. different from the coding game in that, in the hawk–dove game, the two Nash equilibria are such that the two players adopt different strategies (one Restricts while the other adopts Business as usual), while in the coding language game both Nash equilibria have the two players doing the same thing (either C++ or Java). An example of the chicken game: in the 1984 film, Footloose, two high-school students challenge each other by driving tractors towards each other, to see which one will ‘chicken out’ first. How do you think the hawk–dove game would be played in reality? If the first country could commit itself to BAU so that the second country was certain that it would not consider any other strategy, then the second country would play Restrict (Restrict is a best response to BAU, to avoid catastrophe). But the same is true of the other country. We can see that negotiations are bound to be difficult, since each country would prefer the other to take the lead on restricting carbon emissions. Among real countries (not the hypothetical players in our game) the situation is of course more complex—virtually all countries in the world are involved in the negotiations. The payoffs may look different to these varied players. For example, in 2015 China produced 30% of the world’s total carbon emissions, the US was second with half of China’s level, followed by India. On a per-capita basis, however, China produced less than half the emissions that the US did, and India less than an eighth. The game represents the idea that no one wants to see catastrophic climate change, but each is waiting in order to see if others will move first. There is another important aspect to this game—if we consider the numbers in the payoff matrix to be measures of the value of each possible outcome to the citizens of each country so that the total benefits of the two countries could be summed, then we can see that the best outcome for the world as a whole is that both Restrict (total payoffs = 20), followed by the two Nash equilibria with one country free riding on the other’s Restrict policies (16), with BAU for both having the worst outcome. How could the global social dilemma of climate change policy, as represented in this game, be solved? Could the governments of the world simply prohibit or severely limit emissions that contribute to the problem of climate change? This would amount to changing the game by altering available strategies by making BAU illegal. But who would enforce this law? There is no world government that could take a government that violated the law to court (and lock up its head of state!). If the climate change social dilemma is to be addressed, Restrict must be in the interests of each of the parties. Consider the lower left corner (China plays BAU, US plays Restrict) equilibrium. If the payoffs China gets for playing Restrict were higher, when that is what the US is doing, then (Restrict, Restrict) might become an equilibrium. Sustainable consumer lifestyles: As a result of their concern for the wellbeing of future generations, people could come to prefer lifestyles that use fewer goods and services of the kind that result in environmental degradation. This would make the Restrict policy less costly and the BAU strategy less desirable. Governments could stimulate innovation and the diffusion of cleaner technologies: They might do this by, for example, raising the price of goods and services that result in carbon and other emissions, which would discourage their use. In the process, the use of these technologies would become cheaper, lowering the cost of Restrict. For example, renewable energy has become much cheaper. In some regions, it is now the cheapest energy option, which means Restrict is no longer more expensive than BAU. Self-interested behaviour will result in lower carbon emissions. A change in norms: Citizens, non-governmental organizations (NGOs), and governments can promote a norm of climate protection and sanction or shame countries that do nothing to limit climate change. This would also reduce the attractiveness of BAU. Countries can share the costs of Restrict more evenly: This is possible if, for example, a country for whom Restrict is prohibitively expensive instead helps another country where it is less expensive to Restrict. An example would be paying countries in the Amazon basin to conserve the rainforest. After intense negotiations following failed talks and a non-binding agreement in Copenhagen in 2009, the governments of all countries committed to eventual emission cuts at the United Nations Conference on Climate Change in Paris in December 2015, with the goal of stabilizing global temperatures at 2°C above pre-industrial levels. Almost all countries also submitted individual plans for cutting emissions. establish a base of trust to share some of the costs of Restrict and negotiate more ambitiously in the future. Social dilemmas are unavoidable because of a basic fact of human existence: we are social animals. We interact directly and indirectly with thousands of people in a day. Take a single purchase that you have made today—perhaps a coffee—and create a mental map of all the people, their locations, and occupations involved in getting the coffee to the point at which you purchased it. We benefit hugely from our social nature in the friendships, families, exchanges of goods and services, knowledge, and other interactions of which we are a part. Life as a hermit would be impoverished by comparison. As a practical matter, human life in isolation would be impossible. In this extract from his history on economic life, Paul Seabright explains that ‘Homo sapiens is the only animal that engages in elaborate task-sharing—the division of labour as it is sometimes known—between genetically unrelated members of the same species’. Paul Seabright. 2010. The Company of Strangers: A Natural History of Economic Life (Revised Edition). Princeton, NJ: Princeton University Press. But our social nature poses an enormous challenge—how can we organize our interactions in such a way that the outcomes are acceptable—or even, by our own standards—good? Although there are vast mutual gains to be had through interacting with others, there are also substantial conflicts among us about how these benefits will be shared. In the eyes of many people, a desirable society is one that addresses the unavoidable social dilemmas that face us and also distributes the benefits and costs associated with our social interactions in a fair way. Economics has an important role to play in meeting these objectives. How we come to acquire the things that make up our livelihood: Things like food, clothing, shelter, or free time. How we interact with each other: Either as buyers and sellers, employees or employers, polluters and victims of climate change, citizens and public officials, parents, children, and other family members. How we interact with our natural environment: From breathing, to extracting raw materials from the earth. How each of these changes over time. In Figure 1.18 we showed that the economy is part of society, which in turn is part of the biosphere. Figure 2.14 shows the position of firms and families in the economy, and the flows that occur within the economy and between the economy and the biosphere. Firms combine labour with structures and equipment to produce goods and services that are used by households and other firms. The economy of households and firms depends on a healthy biosphere and stable physical environment. A model of the economy: Households and firms. Figure 2.14 A model of the economy: Households and firms. Production of goods and services also takes place within households, although, unlike firms, households may not sell their outputs in the market. In addition to producing goods and services, households are also producing people—the next generation of the labour force. The labour of parents, caregivers, and others is combined with structures (for example, your home), and equipment (for example, the oven in that home) to reproduce and raise the future labour force working in firms and the people who will work and reproduce in the households of the future. All of this takes place as part of a biological and physical system in which firms and households make use of our natural surroundings and resources, ranging from fossil fuels or renewable energy to the air we breathe. In the process, households and firms transform nature by using its resources, but also by producing inputs to nature. Currently, some of the most important of these inputs are the greenhouse gases, which contribute to climate change problems. Humans have always relied on their environment—the physical environment and the biosphere, which is the collection of all forms of life on earth—for the resources they need to live and produce their livelihoods. The environment provides essentials for life, such as air, water, and food. It also provides the raw materials that we use in the production of other goods—such as wood, metals, and oil. Our economy is shaped by millions of direct and indirect interactions among people. These social interactions offer opportunities for mutual gains, but conflicts necessarily arise over how these gains should be distributed. The individual pursuit of self-interest may lead to socially beneficial outcomes. But, in addition to these ‘invisible hand’ situations, there are interactions like the prisoners’ dilemma and the tragedy of the commons, in which people would do better by cooperating rather than acting individually. These social dilemmas occur when people do not take into account the effects of their actions on others, called external effects or externalities. And they give rise to the problem of free riding, where people benefit from the contributions of others to a public good or some other cooperative project without contributing themselves. To understand how social dilemmas are sometimes resolved, we looked at behavioural experiments, which reveal the preferences that motivate people’s actions. We find that, in addition to the self-interest exemplified by homo economicus, social preferences (such as altruism, reciprocity, and inequality aversion) and social norms also influence how we behave. To our economic toolkit we have added game theory to study strategic interactions among people whose actions jointly determine the outcome. A game specifies the players, their feasible strategies, their information, and the possible payoffs. Characteristics of a game include whether it is a one-shot or a repeated game, and whether it is simultaneous or sequential. We visualize the possible outcomes in a payoff matrix, where each entry describes the result of a hypothetical situation in which the players choose certain actions. The dot-and-circle method can help identify probable outcomes of the game. Helpful concepts that have aided our analysis of games include that of a best response and a dominant strategy. We have seen that multiple Nash equilibria (mutual best responses) may occur, and that a dominant strategy equilibrium is a particularly simple example of a Nash equilibrium. Conflicts of interest arise when the players prefer different equilibria, and an economy may get ‘stuck’ in a Nash equilibrium where all of the participants are worse off. The issues discussed in this unit have helped us define economics as the study of how people interact with each other and with their natural surroundings to produce their livelihoods. Understanding these interactions can help us devise policies that yield desirable social outcomes that promote people’s wellbeing. In Unit 2, we discussed how we could use experiments to investigate how people might behave in particular situations. Although we cannot perfectly predict how people would actually behave, the controlled environment of experiments allow us to isolate the effects of a given change and identify specific reasons for the observed behaviour. If we kept all conditions the same and only changed one thing, then we can be more certain that any differences we observe are due to that one change. What effect did the change in conditions (the punishment option) have on behaviour (average contributions)? Are the differences in behaviour ‘large enough’ that we can attribute them to the change in conditions, rather than chance/coincidence? Go to Doing Economics Empirical Project 2 to work on this problem. evaluate the usefulness of experiments for determining causality, and the limitations of these experiments. Aesop. ‘Belling the Cat’. In Fables, retold by Joseph Jacobs. XVII, (1). The Harvard Classics. New York: P. F. Collier & Son, 1909–14; Bartleby.com, 2001. Camerer, Colin and Ernst Fehr. 2004. ‘Measuring Social Norms and Preferences Using Experimental Games: A Guide for Social Scientists’. In Foundations of Human Sociality: Economic Experiments and Ethnographic Evidence from Fifteen Small-Scale Societies, edited by Joseph Henrich, Robert Boyd, Samuel Bowles, Colin Camerer, and Herbert Gintis. Oxford: Oxford University Press. Edgeworth, Francis Ysidro. 2003. Mathematical Psychics and Further Papers on Political Economy. Oxford: Oxford University Press. Falk, Armin, and James J. Heckman. 2009. ‘Lab Experiments Are a Major Source of Knowledge in the Social Sciences’. Science 326 (5952): pp. 535–538. Hardin, Garrett. 1968. ‘The Tragedy of the Commons’. Science 162 (3859): pp. 1243–1248. Henrich, Joseph, Richard McElreath, Abigail Barr, Jean Ensminger, Clark Barrett, Alexander Bolyanatz, Juan Camilo Cardenas, Michael Gurven, Edwins Gwako, Natalie Henrich, Carolyn Lesorogol, Frank Marlowe, David Tracer, and John Ziker. 2006. ‘Costly Punishment Across Human Societies’. Science 312 (5781): pp. 1767–1770. Levitt, Steven D., and John A. List. 2007. ‘What Do Laboratory Experiments Measuring Social Preferences Reveal About the Real World?’ Journal of Economic Perspectives 21 (2): pp. 153–174. Mencken, H. L. 2006. A Little Book in C Major. New York, NY: Kessinger Publishing. Nasar, Sylvia. 2011. A Beautiful Mind: The Life of Mathematical Genius and Nobel Laureate John Nash. New York, NY: Simon & Schuster. Ostrom, Elinor. 2000. ‘Collective Action and the Evolution of Social Norms’. Journal of Economic Perspectives 14 (3): pp. 137–58. Ostrom, Elinor. 2008. ‘The Challenge of Common-Pool Resources’. Environment: Science and Policy for Sustainable Development 50 (4): pp. 8–21.